Here is our rendition of a timeless classic unisex wallet originally carried by cabbies in New Your City and has now become a favorite of travelers. I remember my mother always had a wallet similar to this one that she would reach in and pull out some change while we were at the five and dime store so I could get some candy or a drink from the soda fountain. What fond memories. 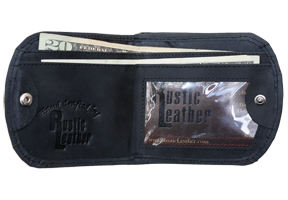 This wallet features two cash pockets to separate U.S. and foreign currency, interior ID window plus a gusseted snap pouch for loose change and credit cards. It also has a "hidden" pocket on the spine that works great for business cards. 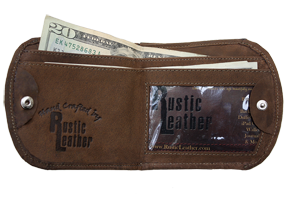 Tuck this compact wallet in your front pocket or Rustic Leather bag and you are ready for your next adventure. 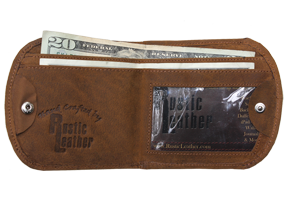 "Great wallet. It's molding very nicely to all the items I put in it. I like that I some times have to check and see if I forgot it cause I don't feel it in my pocket. Thanks for a great wallet!"